Home Tips	Bridal Shower Games you won’t hate…. The other game is called “Guess Who? Bride or Groom?” There is a list of questions about the happy couple and you guess things like “who will cry on the big day?”, etc. I’ve seen several versions of this game on Pinterest and it would be easy to replicate or make up your own set of questions. My niece found this one and we all thought it was cute! Everyone plays except for the mothers and the bride. After everyone completes the quiz, the bride gives the correct answers. And the winner gets a prize! Also, did you know you can buy tiny little stickers that go on the bottom of Hershey Kisses? I found these adorable Paris Eiffel Tower stickers on Amazon. The vendor is JS&B Enterprises. You can buy 216 Paris Eiffel Tower Stickers for $9.99. Then you just peel and stick. So simple and it really adds a fun Parisian touch! 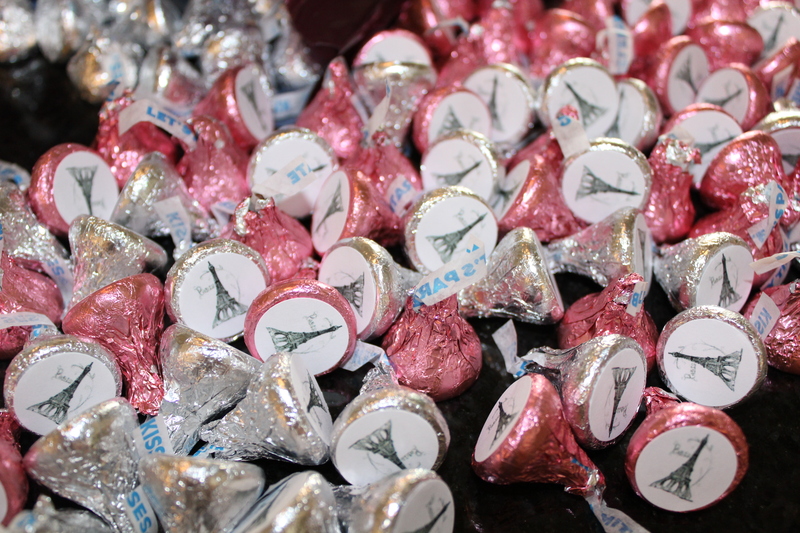 We used the kisses with the Eiffel Tower stickers in the party favor jars and in the candy dishes on the tables. I’ll share the sweet party favors soon. The bridal shower was so much fun and the games were quick and easy. Plus, we learned a few fun things about the bride and groom! Here are a few more pictures from the fun day. The kitchen island set up with the games and party favors…. The beautiful dining room chandelier decked out in pearls and paper flowers, which I LOVE. And some of the gifts…. Some glittery Eiffel Tower picks. My sister-in-law found these and used them to skewers donut holes for the shower. After we ate the donuts, I stuck a few in my cupcakes. These didn’t last long either! The shower came and went and next up we have the rehearsal and rehearsal dinner. The Bachelor and Bachelorette parties are forth coming but those won’t involve me so I can relax for a while! Wait, I still need to pick out invitations for the rehearsal dinner and a few dresses to wear for the big weekend. Yikes! I guess I can’t relax for too long!